COMMENTARY – It was quite a weekend on The Hill for Ute fans. Three athletic contests in four nights. A Dickensian tale of two teams. One squad dominated, the other let two winnable games slip through its fingers. Let’s start with the Red Rocks who continue to rock the house every time they take the floor. Utah was ranked No. 5 in the pre-season national poll, and promptly proved that they belong at or near the top of the rankings. The Red Rocks posted an impressive score of 197.00 in the first meet of the season. Last year, Utah didn’t manage 197 points or more until their third meet, and only accomplished that feat twice in their first six meets. It will be interesting to see if they can maintain their momentum in upcoming meets. Only LSU had a better opening weekend with a score of 197.150 and the top spot in this week’s rankings (which are determined by average meet scores for the first part of the season). The Red Rocks continue to dominate in terms of fan attendance. Utah had 14,805 fans for its first meet, whereas LSU only had 10,755, followed by Kentucky with 10,006 (with the next highest being UCLA with 6,657 and a steep drop in attendance after that). Georgia opens against Alabama this week, so the Buldogs might give the Red Rocks some competition in terms of attendance. Utah’s victory last Friday night came at the expense of BYU. 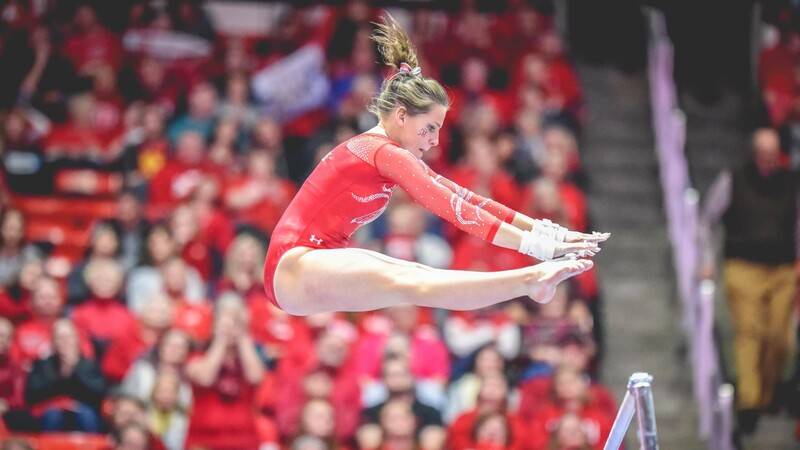 While a 2.725-point margin of victory would be considered a very close match in most sports, it was a veritable blowout of the Cougars by the Red Rocks in terms of a gymnastics meet. Unlike football and basketball, the gymnastics rivalry with the Team Down South isn’t even close. Utah has beaten BYU in 37 straight meets, with an overall record of 95-2 (and one of the Cougars’ wins came when Greg Marsden prematurely pulled the Red Rocks out of the meet in protest of the scoring by the judges). Utah benefited from strong performances from a number of gymnasts, highlighting the depth of this talented squad. Senior Tiffani Lewis set the tone with a 9.90 on vault in only the third routine of the meet for the Red Rocks. Lewis also set the proverbial bar with a 9.85 in Utah’s first routine on bars. Utah’s floor routines could not have started better with Lewis posting another 9.90 in the first routine. Lewis also has the best pre-routine video bio of any gymnast, with a beautiful blend of spunky confidence and delightful charm (but it does not appear to be available online, so you are going to have to attend a meet in person to see it). Sophomore Kim Tessen established herself as a top performer after only seven routines in competition last season before missing the final 11 meets with an injury. She duplicated Lewis’ 9.90 in vault immediately following Lewis in the rotation. Tessen also posted a 9.775 on bars immediately preceding MyKayla Skinner in the clean-up spot. All-arounders Skinner (a sophomore) and MaKenna Merrell-Giles (a junior) are destined to push each other all-season long. Last season, Skinner was the all-around Pac-12 champion and runner-up in the NCAA nationals. Merell-Giles was a second-team all-arounder in both the Pac-12 and the NCAA nationals. Last Friday night, Skinner and Merrell-Giles tied in the all-around with identical scores of 39.475. Admittedly, the tie was primarily the result of Skinner stepping out of bounds on the last tumbling run of her floor routine on the final routine of the meet (which resulted in a 0.10-point deduction, but Skinner still earned a 9.80 for the routine). Merrell-Giles took home the single bouquet of flowers available for Utah’s top performer (perhaps in recognition of the fact that Skinner will likely be taking home the bouquet at most meets for the remainder of the season). Red Rocks gymnastics is amateur athletics at its finest. The pure joy exhibited by the gymnasts after hitting a routine is a pleasure to watch. In particular, Skinner’s enthusiasm after each routine is entertaining, and inevitably contagious among the other gymnasts. The devastation and despair of a fall only reminds all of us of our faults in our own endeavors. Notably, the Utah crowd is very supportive even when opposing gymnasts fall. The Red Rocks go on the road in Reno this weekend for a quad-meet against UCLA, Stanford, and Washington in an event designed to replicate post-season competition. Meanwhile, back on The Hill, the Runnin’ Utes ran out of gas in both of their games last weekend. Utah hosted the Pac-12’s only ranked teams in Arizona (currently No. 17) and Arizona State (currently No. 11). The Runnin’ Utes went 0-2, but it was how each of those games played out that was really defeating. Also notable was the reversal of roles between Utah and Colorado from week one to week two of the conference schedule. The Runnin’ Utes swept both road games against the Oregon schools, whereas the Buffalos dropped both games by an average margin of defeat of 17 points. In contrast, Utah lost to both Arizona schools at home while Colorado beat them both. Both games on The Hill last weekend were tied at identical scores of 77-77 with just minutes left to play (to be more exact, with 3:45 left to play against Arizona and 0:43 left to play against Arizona State). After the Runnin’ Utes showed considerable heart and effort to get back into the game and tie the Wildcats at 77-77, the final three-plus minutes was a veritable meltdown. Utah missed three layups, committed three turnovers, committed eight fouls, and didn’t shoot a single free throw themselves. 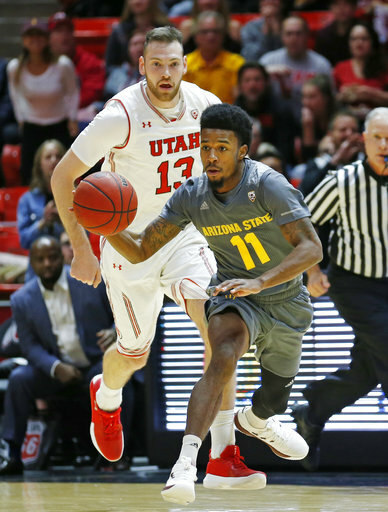 The game against the Sun Devils was a close game for virtually the entire game, but in the waning seconds of the game, the Runnin’ Utes could just not get it done (even after three of Arizona State’s players fouled out). Two of the most concerning trends from recent games are poor interior shooting and poor rebounding. Against Arizona, Utah shot a higher percentage from the 3-point line than it did inside of the arc. The Runnin’ Utes have shot better from distance in three of their last five games, and four of their last eight games. Utah has a 2-2 record in those four games, losing to Arizona and Butler, but beating Northwestern State and Oregon State (which are games the Runnin’ Utes should have won anyway against clearly inferior opponents). One common thread in the losses to both Arizona and Butler was a lot of missed shots at the rim. If Utah continues to miss shots at the rim, that is going to translate into a number of losses in Pac-12 play. The Runnin’ Utes have been outrebounded in every conference game they have played (including their two wins). Arizona had twice as many rebounds as Utah (46-23). The Runnin’ Utes are dead last in the conference in both offensive rebounds and rebounding margin, and second to last in the number of defensive rebounds. In conference play, Utah’s total rebounds per game have plummeted to 26.0 from the 37.7 rebounds per game garnered in non-conference play. The road doesn’t get any easier for the Runnin’ Utes as they travel to Los Angeles this week for games against UCLA (Thursday) and USC (Sunday). Here’s hoping the Red Rocks continue to rock, and the Runnin’ Utes can prove to be true road warriors.